WordPress has the distinct honor of being a highly configurable Content Management System (CMS) that was originally designed to address the needs of bloggers. Nowadays, it serves bloggers and businesses hellbent on pushing a product, service or content in the hopes of being seen in the bustling industry that is the Internet. Here are our picks for the best flex slider WordPress premium themes available. Some cater to the professional blogger or business, some to the photo aficionado, but each caters to someone. Following are some more related articles that you may like to browse through: Video Player Plugins for WordPress, Free WordPress Photography Themes and Awesome Free Thin Fonts. 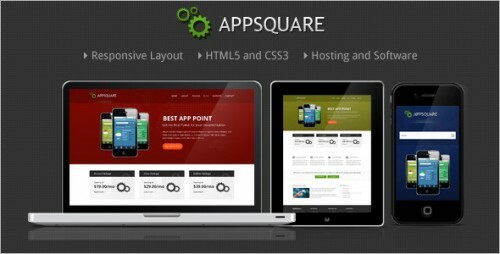 AppSquare is a modern and responsive wordpress theme for software business and hosting company websites. 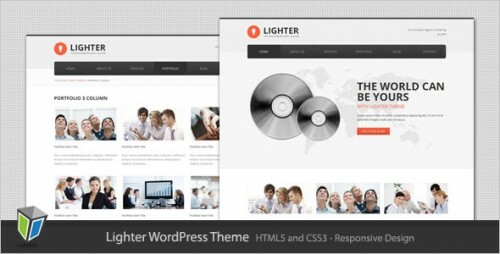 Lighter is a clean and modern wordpress theme for corporate, business and company websites. Features as like Simple and Unbranded Theme Options, Built-in Sidebar Manager, Option to use Right or Left sidebar, Multi Level Dropdown Menu and more. 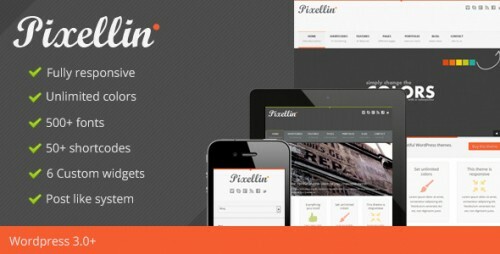 Pixellin is a responsive WordPress theme designed with you in mind. This theme is easy to use and has alot of new features! For example the sliders: Cycle Slider and the responsive Flex Slider. 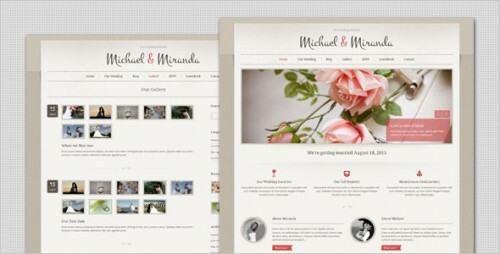 Wedding is modern and elegant wordpress theme perfect for wedding websites. This theme also suitable for personal, portfolio and gallery websites. 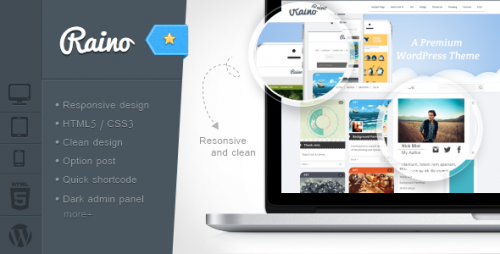 Raino a modern WordPress theme perfect for blog and personal websites. clean wordpress theme with focus on readability & very easy to setup. 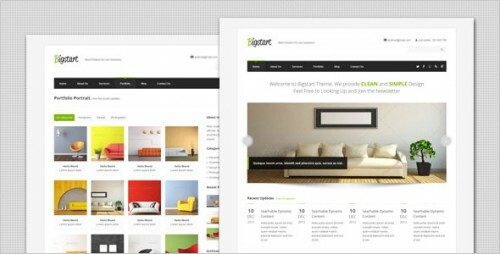 BigStart is a simple and clean but flexible wordpress theme suitable for any business or portfolio, and it’s created by using the latest HTML5 and CSS3 techniques. 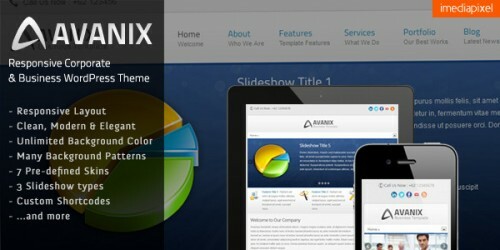 Avanix is responsive clean,elegant and modern corporate and business WordPress theme that can be switched as business and portfolio theme. This is the wordpress version of the five start rated html template called “Me”. It designed and built with user experience in mind! Goodway is a modern entertainment wordpress theme perfect for film, tv, movies company and agency sites. myHosting is responsive hosting and business WordPress theme that can be switched as hosting base and business theme, suitable for any desktop and mobile devices. Compasso is a premium Magazine/Blog WordPress theme built with HTML5/CSS3. It is well suited for magazine, blog, or any websites with great amount of contents. Modern Interiors is our new Responsive WordPress theme that was created specifically to fill the gap in interior design and decoration services that are always in need. BuddyPress & bbPress compatible. Reviews with unlimited rating criteria. AJAX powered advanced theme options panel. Fully localized, multi-site, and WPML ready. Shortcode Generator (130 short codes included). Think is a clean and responsive wordpress theme for corporate, business and company websites. This theme also good for portfolio and any kind of websites. SmartGroup is a clean and modern wordpress theme for marketing, corporate, business and company websites. Walk theme for WordPress is designed for corporate websites, personal portfolio and multi-purpose business ventures. Pure Paradise is a clean and minimalist wordpress theme for real estate company, also suitable for business, corporate and marketing.